Woop Dee Do, under jockey Cristian Esqueda, rolls to the top time in the Iowa Double Gold Futurity at Prairie Meadows Saturday night. ALTOONA, IA�AUGUST 15, 2015�Three two-year-olds sired by Royal Vista Ranches stallions qualified to the Iowa Double Gold Futurity on Saturday night at Prairie Meadows. 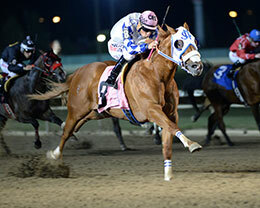 Coming off an impressive win in the Heartland Futurity on July 4, Woop Dee Doo rolled to a 4� length trial win Saturday night to post the top qualifying time for the Iowa Double Gold Futurity at Prairie Meadows. The 10 fastest qualifiers, from the five trial races contested, will return to Prairie Meadows on Saturday, August 30th to vie for the winner's share of a $50,000-added purse going 350 yards. Under jockey Cristian Esqueda, Woop Dee Doo bobbled the start but recovered to dominate the field by more than four-lengths while posting the top time of :17.666 seconds. It was the third straight win in five starts this season for gelded son of first crop sire GOOD REASON SA. Ricardo Martinez owns-and-trains the California-bred earner of nearly $63,000 this season. John Andreini and Vince Genco bred Woop Dee Doo from the Mr Jess Perry mare Jess Racy Eyes. Bill and Tom Maher's One Ivory Sign clocked the seventh fastest time of :18.036 seconds. Jason Olmstead trains the IVORY JAMES gelding out of Stylish Sign, by Vital Sign. Cody Smith rode the Mixer Ranch Oklahoma-bred. The gelding has a (5) 1-0-2 record this season and has earned $12,167. The lightly raced R O With Good Reason qualified 10th from the same trial as One Ivory Sign. Jockey Cody Smith rode the son of champion GOOD REASON SA to an :18.076 clocking. Ed Ross Hardy saddled the gelding in only his third career start for owner LP Racing. Miranda Lynn Prewett bred R O With Good Reason in Oklahoma from the Shazoom mare Running Option. For the complete list of Double Gold Futurity qualifiers, times, sires, dams, owners, breeders, trainers and jockeys CLICK HERE. GOOD REASON SA stood his only season at Royal Vista Ranches before his untimely death in 2012.